We are looking for a way to have our business established and self sustaining in order for us to have a bit of fun without worry. Right! 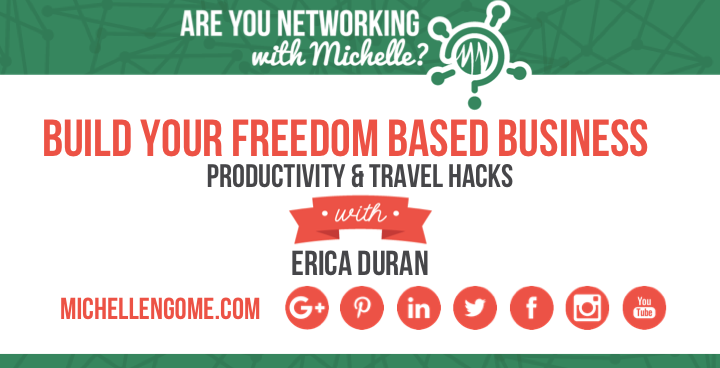 Well Erica Duran is a business coach and a freedom based luxury lifestyle designer that helps entrepreneurs build a business that can work from anywhere and earn consistent income. How to identify specific needs in our business? How to grow our revenue from 1K to 5K/month with the ability to travel? Pricing strategies for a service based business. Explains the 5 myths of attracting high paying clients. Also check out Erica’s podcast Freedom Based Lifestyle Design Radio Podcast & Web TV Show. For more information visit her website https://ericaduran.co. Are you looking for a speaker to discuss connection points to develop better business relationships? Watch this quick video and contact me today! If you are interested in honing in on your niche, crafting your message, identifying goals, and building a circle of influence when it comes to leveraging your brand take the opportunity to jump on the Icebreaker Call. Valued at $197, this is a one on one coaching session to help you define your area of expertise and discover the action steps to reach your goals.